The FCC vote to destroy the Net Neutrality protections cannot stand. I'm calling on you to work with your colleagues to use the Congressional Review Act to pass a "resolution of disapproval" reversing the FCC's vote. The FCC's Dec. 14 decision willfully ignored the public outcry from millions of people, and it abdicated the FCC's responsibility to protect the internet from ISP blocking and discrimination. We need members of Congress to stand up for the open internet and for the digital civil rights of their constituents now. Please use the CRA to pass a resolution of disapproval. The FCC vote to gut the Net Neutrality protections — willfully ignoring the outcry from millions of people — cannot stand. We can't let Chairman Ajit Pai have the last word on this and that's why we're calling on Congress to overturn this vote. Congress needs to use a "resolution of disapproval" to undo the FCC's vote to dismantle the Net Neutrality rules. 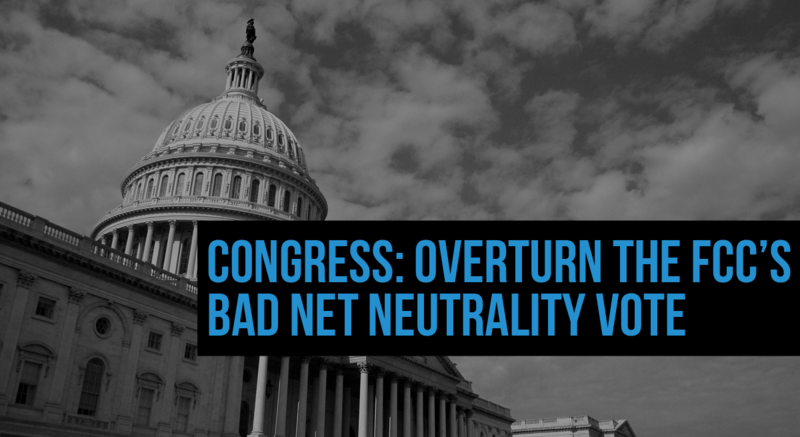 Urge lawmakers to reverse the FCC's Net Neutrality-killing vote today.